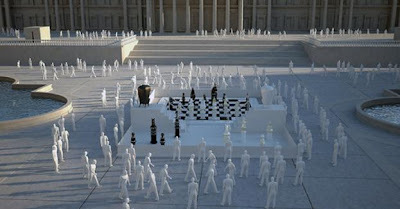 Ever wanted to play chess here? Where? 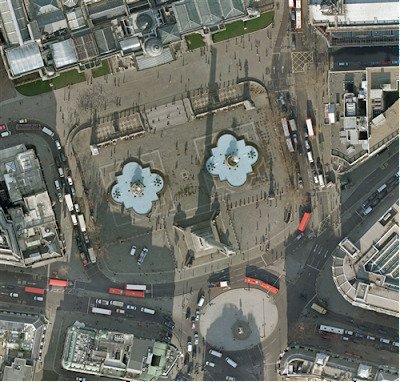 I hear non-Londoners ask, not recognizing the shadow of Lord Nelson's Column reaching past the fountains, on toward the grassy banks of the National Gallery, proudly guarded by four imperial lions. Trafalgar Square of course, that's where. Not especially, I hear London chess players answer. And if I did, couldn't I just take a pocket set? But I should have told you more. I should have said, ever wanted to play here with a gigantic chess set, your pieces spanning the board from one fountain to the other; the board itself a mosaic made from glass, the ceramic pieces themselves towering two metres high? And all that the "centrepiece" of the London Design Festival and brainchild of Spanish designer, Jaime Hayón? Well, guess what. Maybe you can. The chess games will be played from Saturday 19th to Wednesday 23rd September, and you can find the entry form on the London Design Festival Website. Good luck if you enter. What colour square is that on the right hand side, do you suppose? "A stolen chess set is the key to a kidnapping". Anybody willing to admit knowing anything about this one? 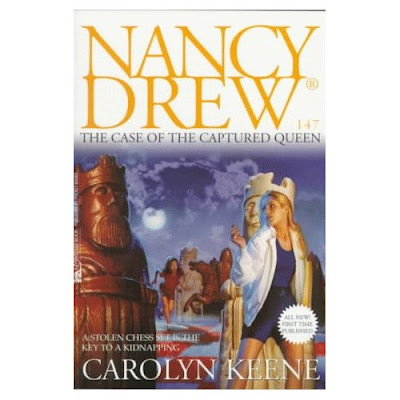 Incidentally, that surname ... could the author be related to RDK? Could it even be Raymondo in disguise? Anyhoo, today's post marks the end of our daily schedule. From tomorrow we'll be back to posting four days a week:- Monday, Wednesday, Friday and one at the weekend. Most chess clubs are rather subdued introverted places dedicated to the pursuit of our favourite, if not-yet-popular-enough, game. 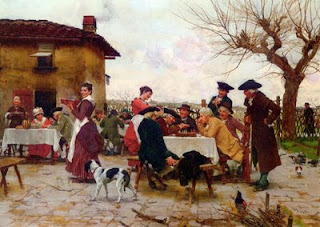 In nineteenth century Italy they may have thought that comely serving wenches would broaden its appeal. 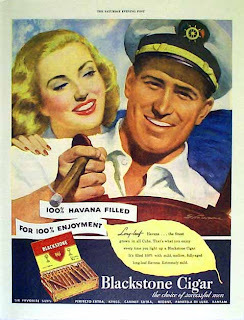 Come on down and get a rollicking good game, even if the rest of the company is distracted by feasting, carousing, and other ribald diversions. That's the message from Sorbi's rumbustious extravert image. You might be in Italy, but there's little chance of a quiet game here. Although you can't see the position on the board, it is obvious that a tame draw by repetition is not on the cards. Yes. 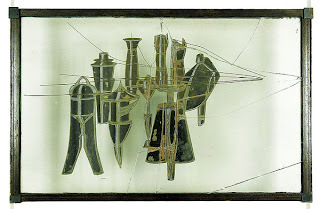 Draw by repetition: the artistic credo of Signor Sorbi, whose pencil, followed by his brush, recycled the scene several years later, albeit in a mirror image, sort of. It is spring at last, and the willow, now on the left, has burst into leaf. A brace of horsemen appear to have stopped by, and enjoy the last glimmer of the low evening sun. This is a rather daring innovation and Signor Sorbi must have been pleased with himself. Carried away he airbrushes the game of chess. If the artist has second thoughts it would be no trouble to pop it back in, and our rather forward friend could play his move without so much as j'adoube. 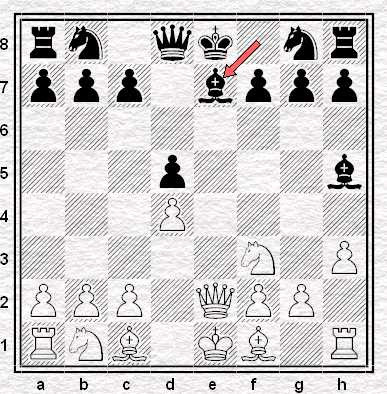 The simple God-fearing fellows would continue their debate; "White pawn to queen's knight fourth in the Italian Game, on move four!?" "Mamma Mia, for an 'acker it is manna from the 'eavens"...and so on. For the most part it's a lively scene. 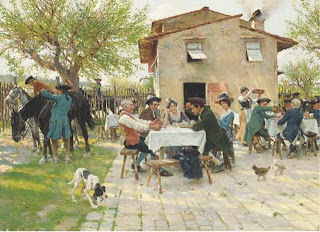 A gentleman gallantly offers a chair (blink, and it's done); an order catches the waiter's eye (quick, or he's gone); and to the left a fellow nods his head in a passing encounter (bows, and moves on). Meanwhile, the chess party, unnoticed and oblivious, play their interminable game. The artist may have put them in his picture, but at the same time he contrives to put them beyond the pale. Not that you have to be in a crowd to not play chess, or be ignored playing it. 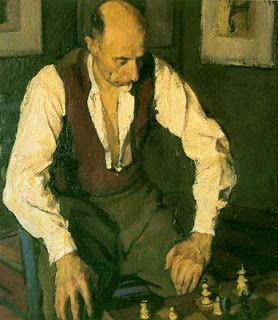 In Chessa's atmospheric and contemplative study he shows that chess can also not be played in the privacy of one's own home. 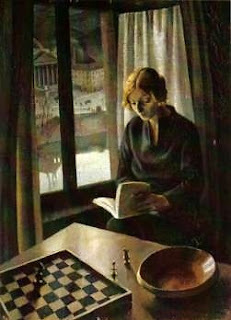 She has buried her nose in her book, and the reduced position on the board might suggest that she is absorbed in an obscure endgame treatise, but more likely some racy potboiler from the burgeoning genre of probablygotnothingtodowithchesslit . Some pictures look both modern and old at the same time, and Chessa's has the clean cut and strong design of a something contemporary, with mood music from the neutral art deco colouring. But the intimate interiority, and play with space and light, calls Vermeer to mind. 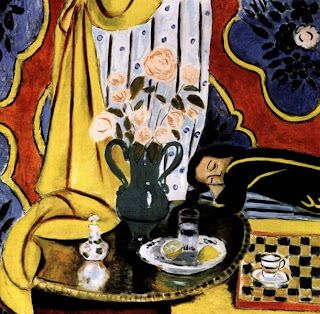 Matisse doesn't look back. He is the master of languor, of not doing much, of not playing chess. There is an outrageous asymmetry in the composition, with the high-keyed roses dead centre, and all the action, or lack of it, to the right, reinforced by the yellow/black contrast. The heavy swag tries to balance the design, but one's eye is drawn irresistibly to the sleeping beauty. She has surrendered to the rich and sumptuous décor, heavy with the scent of musk. She does not play the game, but dreams of using the board as a drinks tray. 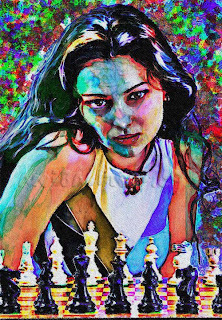 If you comb the Chess in Art Resources you'll find rather too many artists not painting people engaged in the mentally challenging, spiritually uplifting, socially useful and environmentally friendly activity of the royal game. 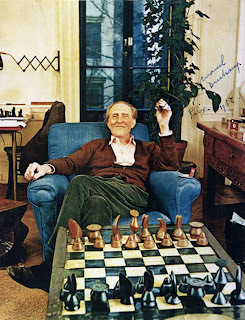 To murder Marcel Duchamp's famous line: while all chess players are artists, not all artists paint chess players. Pablo Sarrio Bambo v Adrian Villuendas Valero, Aragón Individual Championship 2009, round five. 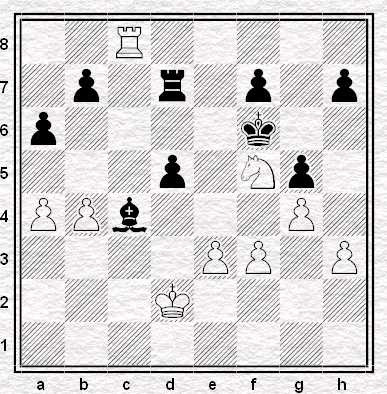 Position after 4...Be6. The position above appeared on board eleven after a few minutes play: I was sitting to White's left, playing on board twelve. My game began 1.d4 d5 2.Nf3 c6 and I wondered briefly, before playing 3.c4, whether Black might try 3...dxc4 4.e3 Be6, which I'd noticed had been the opening of a recent annotated game in Chess Today. In fact Black played 3...e6 and I replied with 4.Qc2 but having had the variation in mind, I experienced some slight surprise when looking to my right and seeing that it had apparently appeared on the very next board. In fact it hadn't, quite: Black had a knight on f6 and his pawn was still on c7, though whether the Be6 manoeuvre is more or less eccentric, in a QGA, than it is in a Slav, I couldn't say. Anyway, shortly my opponent embarked on a long think so I went for a wander to see what was going on elsewhere in the tournament hall. When I saw that it was my turn to move again, I came back, sat down and noticed that I was sitting next to this. 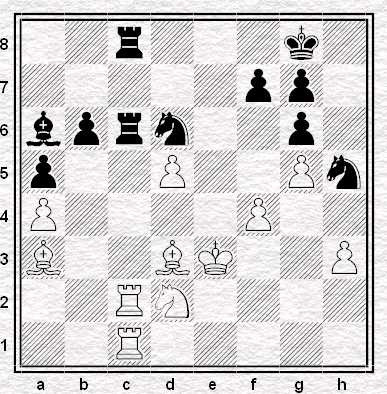 White was looking at the pawn on b5 as if trying to work out how it had got there. Black, for his part, had got up and walked away, possibly wishing to allow his opponent to suffer his embarrassment alone. 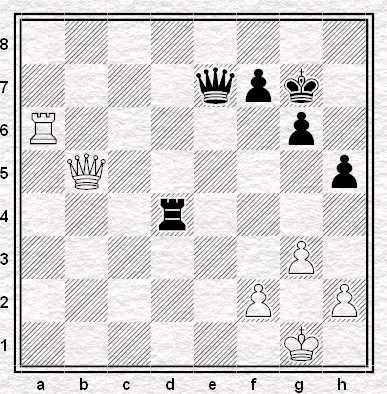 White eventually put his queen on c2, waited for Black to come back to the board and resigned. On my left, White never turned up at all: Black sat looking at the starting position for half an hour and then went home. Some try to play: others, perhaps, conclude that it is better not to play at all. 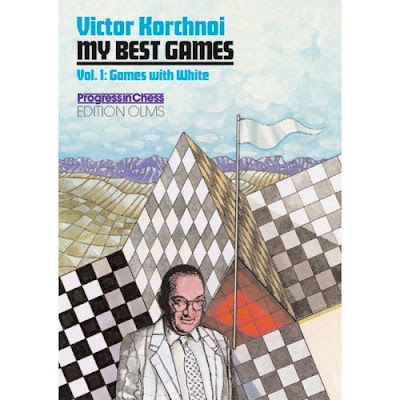 I picked up a copy of Korchnoi's My Best Games a few days ago. Given that I'd just been watching him play at Simpsons-in-the-Strand and Chess and Bridge had the book on sale at 50% off it seemed like a pretty good way to celebrate finally getting my dissertation finished. It was due to that very piece of work, incidentally, that I was in the LSE library for most of the last round of the Staunton Memorial but the next day Andrew Stone sent me an email with an eyewitness account of how Korchnoi won his final game. This was a very fitting way to bring the event to a close since Korchnoi had been the last one to finish in the first couple of rounds too. Ironic, perhaps, that the time I most enjoyed watching him play chess was the day of his shortest game. Streatham & Brixton Chess Club were well represented for the 5th round. As blog Art Correspondent Martin Smith sat in the tournament hall, Morgan, Angus, Bob Cutting and myself - joined by Carsten not long before the end - took over a table in the bar area and spent the afternoon analysing Korchnoi's game against Terrence Chapman. For the only time in the whole tournament I found myself rather conflicted. On the one hand I was just as keen for Korchnoi to win as usual but on the other Chapman had opened with the Reti - the opening phase being somewhat similar to Ivanchuk-Alekseev from yesterday's post - and I very much wanted the honour of one of my favourite systems to be upheld. Perhaps it was the illustrious surroundings but our little group was on good form that day. We managed to predict nearly all of Korchnoi's moves, our accuracy surprising me at first but I soon got used to it. As Morgan said, Old Vik's games give off the illusion that you can understand what's going on so it seemed quite natural that we were able to tell what he was going to play next. Once the game itself was over we were lucky enough to get a good view of the post-mortem and happily the fantasy was quickly shattered. We might have got the moves but of course our justifications were hopelessly inadequate. Korchnoi's enthusiasm to explore the game he'd just won was simply extraordinary and watching him analyse was a real treat - one of my personal highlights of the whole tournament in fact. 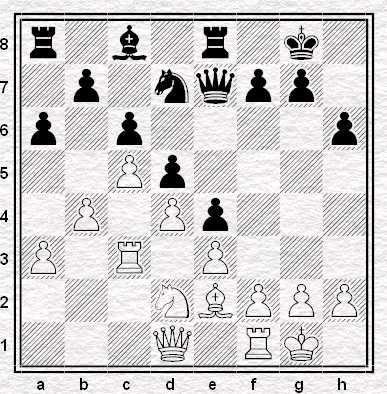 I particularly enjoyed the moment when they looked at the position where White was to play his 22nd move. 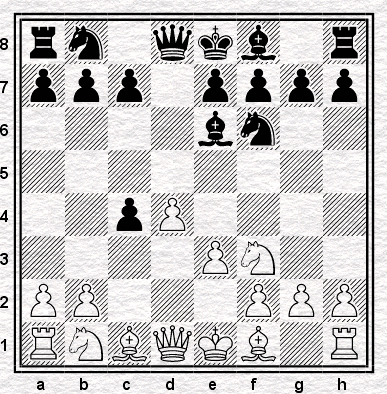 Korchnoi picked up Chapman's queen and slapped it down on b3. "Why didn't you play here?" 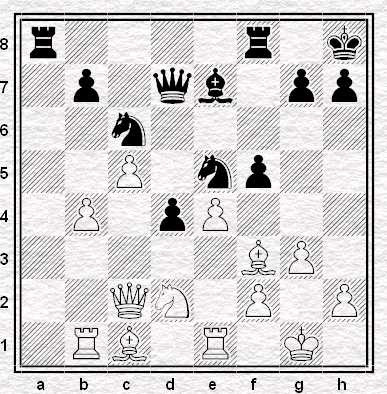 Chapman said he'd wanted to return his bishop to g2 to get it out of range of Black's knight to which Korchnoi responded that if he'd have wanted to take the bish he could have done so last move (which was ... Kg8-h8) and then with a chuckle in his voice he flashed out a variation that showed 22. Qb3 would have been dangerous for White in any event. If only I could remember it! Korchnoi's final score of 6/9 (3.5/4 with Black) including just two draws was impressive but more remarkable still is the fact that his encounter with Chapman was his only game that ended in less than fifty moves. I was about to say that I hope to have his energy when I'm 78 but frankly I wish I had it now. Staunton Remembered I - some tired players after the British? Today I'm taking some time off from the Staunton Memorial to catch up with Vassily Ivanchuk's adventures at the recent Jermuk Grand Prix. EJH brought Chucky's game against Alekseev to my attention a couple of days after it was played although the internet being what it is I had already heard of it from a thread over at www.chesspub.com. The GMs weren't paying too much attention to that stuff about knights on the rim. In fact it would seem that the steed on b4 was so embarrassed about being the only one of the quartet not to be loafing around on the edge that it immediately committed suicide. 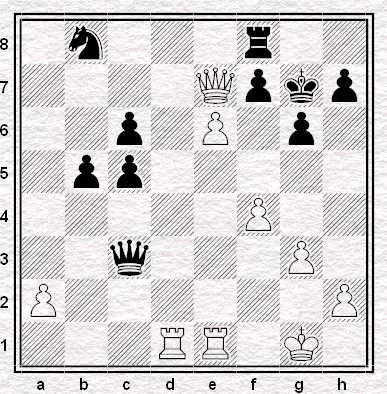 Horton v Tirapo Larcuen, Aragón Individual Championship, round two, position after 89...Nxa6. I played the longest game of my life on Sunday evening. 125 moves and we were on our third scoresheets before we were done. I'm pretty sure if not been beyond move eighty before. 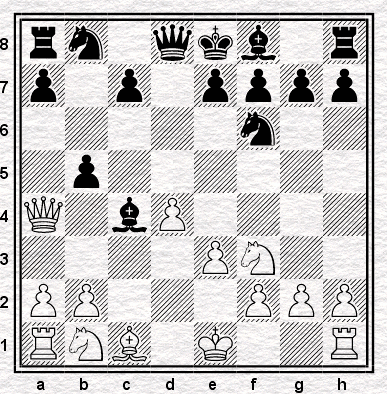 It was, as well, the first time in my life I had the chance to mate with bishop and knight against king. I must have taken a little more time than that. I played 36 moves after the final capture: as I began the sequence with just a minute or two left, finished it with six to my credit and had thirty seconds' increment each move, it's not too hard to calculate that I must have used a little less than a quarter of an hour. 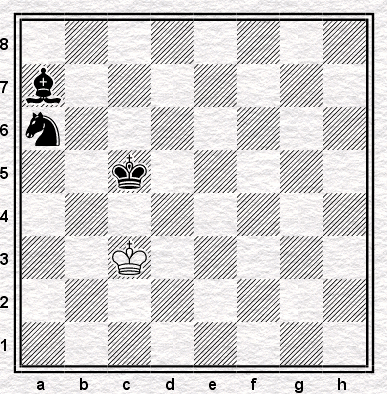 Most of it, I should imagine, in the first part of the process, driving the king to the wrong corner. (I actually relaxed a little after capturing the final pawn, almost forgetting that the clock was still running. That would have been a desperate tragedy even by my standards.) Just as well, too. There was just a moment or two where I was unsure, where the king didn't go the way I expected it and I was glad of the time to think. My opponent resigned, having waited to see if I might stalemate her, two moves before mate. Twenty-six years, or maybe twenty-seven I've waited to do that. Thirty-six moves, plus the two more it would have taken to deliver mate: it would have taken me thirty-eight in total from the starting position. Nalimov reckons it can be done in twenty-eight. Can you do better? Do you like chess? Do you like computers? Do you like Wallace & Gromit? Yes, that's right. Wallace has only gone and invented a chess playing machine - and Gromit is taking it on. But luckily for Gromit, his opponent is not playing on Deep Bleu mode, only advanced. Not so tricky now, you might suppose. Two rooks ahead. Why? As you can see, his bishop is broken. What's the Informator symbol for that? Alas, it turns out pepper gives Gromit the sneezes. After which . . .
. . . devastation. Only the white king remains. 1-0. We've all been there. What else can I say? 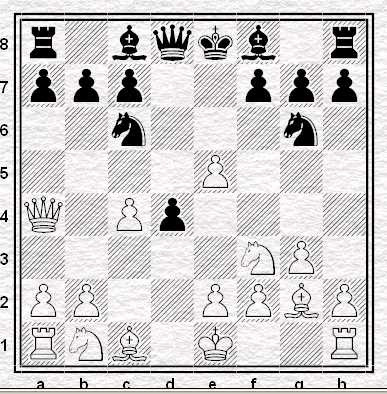 Only that the images are from this game, and to note approvingly that a white square is on the right hand side of the chess board. PS. Jonathan B's asked me to add that we'll be posting every day again this week. I hope I didn't give the wrong impression last time - it wasn't all short draws at the 7th Staunton Memorial. There was some great chess played too. Today we've got three finishes from the Scheveningen section to calculate to get your brain working this Sunday morning. I had six Blacks at Benasque: all six were opened with 1.e4. A small sample, of course, far too small to be of any statistical significance, but nevertheless the absence of alternatives raised my eyebrows just sufficiently far to induce me to ask I asked myself whether it represented any sort of pattern. I started looking through my scorebook, beginning with the most recent games and working backwards, looking for games that my opponents opened 1.d4. I found examples soon enough, but oddly - or, at the time, I found it odd - none of them involved players rated higher than myself. The six black games at Benasque, by contrast, had all involved players whose FIDE ratings were lower than mine. So I looked further - and though, eventually, I did come across games with lower-rated opponents playing 1.d4, another pattern emerged. 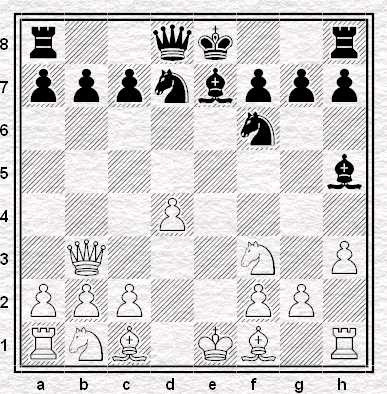 While higher-rated opponents tended to accompany the move with 2.c4, the lower-rated players did not. None of them did. There were Colles and Torres. There were games where c4 was played rather late on. But there were no Black games with a d4/c4 set-up as a first choice: not until I got as far back as February 2006, in which month I played two of them. A Slav and a Semi-Slav, both games against players graded not far below me (in the 160s ECF). February 2006. That's nearly three and a half years ago. those of relatively similar strength (between those two figures). This involved making a couple of executive decisions regarding move-orders. 1.d4 2.Nf3 and 3.c4 - a sequence I employ myself - was categorised as falling under 1.d4 and 2.c4, given that it's intended to reach the same variations and positions. Similarly, 1.c4 and 2.d4. However transpositions from the Colle to an e3 Slav - there were a couple of these - were not, as I considered that the intention had been to play a Colle. The table I thus compiled is below. What, if anything, does it tell us? On one perfectly reasonable approach, not very much, since 100 games is still a very small sample. (I'd be interested in the opinion of anybody with qualifications in statistics, but I think I'd want perhaps 10,000 before coming to any serious conclusions.) Moreover the fact that all were played against the same opponent might in itself cause the statistics to be skewed, given the possibility of preparation, of opening choices being influenced by the identity (and for that matter the playing strength) of the particular opponent. Still, they are the statistics I have, so they're the ones I'm working with. Note that because they are based on exactly 100 games, it's simple to add together figures to get overall percentages, so for instance we can see that 1.e4 was selected in 62% of games, d4/c4 in 21% and "others" in 17%. Nothing utterly startling there, though the figures for "others" would, I think, be rather lower at professional level. But what does stand out, for me, is that for players rated below 2100, d4/c4 systems are outweighed by "others" by a ratio of 3:1. There's an obvious contrast with the higher-rated categories: in the middle-strength category the ratio is 2:1 the other way and in the highest, the imbalance against "others" is more than 5:1. There's a slight falling-off in the use of 1.e4, the higher we go: it was employed in 57% (17/30) of all games in the highest category, but 65% (17/26) in the middle and 64% (28/44) in the lowest. Whether or not that would be reproduced with a bigger and better sample, I'd be interested to know: I was a little surprised to see players below 2100 apparently no more fond of 1.e4 than players between 2100 and 2200. A better sample would of course show whether that was actually so. But it's the differential between d4/c4 and "others", among the lower-graded players, that really commands the attention. Partly because of the way in which it reverses the situation obtaining in higher-strength categories - partly in and of itself. That 1:3 ratio, if it's an accurate reflection of the general reality, would tell us a lot about how lower-graded players approach their openings - and it might also tell us a lot about how they should approach their openings. 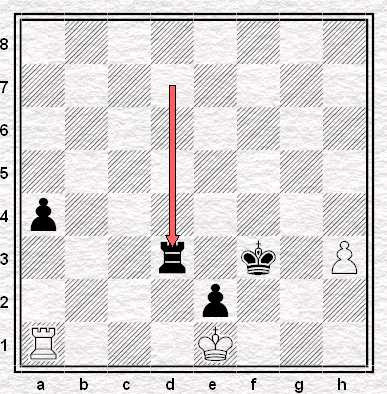 It's been written* that at club level, 2.c3 in the Sicilian is the main line. If that's true, it may be similarly true that at club level, where 1.e4 is not selected it's the alternatives to d4/c4 that are the main line: not the traditional d4/c4 set-up at all. To a surprisingly large degree, but a large one nonetheless. 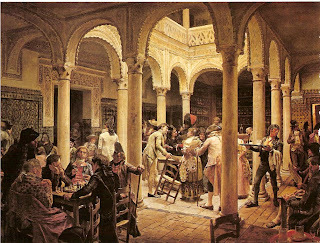 How many club players, studying their repertoire as Black, spend three times as much time studying those alternatives - Reti/English, Colle, Torre, Trompovsky and so on - than the Queen's Gambit and Indian lines which have been dominant for several generations at a higher level? My guess would be along the lines of "none, or close to none". But it might be wiser if they did. Of course, if everybody did, then people would start playing the "main" lines after all, but as it stands, if your opponents are overwhelmingly below 2100 in strength - and this is presumably the case for most club players - then it's quite likely, at the moment, that when you're looking at opening theory that will be of actual use to you, you're looking in very much the wrong place. It's a lesson it's taken me thirty years to learn, that you basically want to prepare for opponents you're actually likely to meet. Of course it's true at the same time that the higher-graded your opponent, the more they're likely to know and understand, and so it can be helpful to spend more time thinking about what to do against them than you is proportional to the regularity with which you meet them - especially if, like the the present writer, your opening choices vary to some extent, contingent on the strength of the opposition. But still, if you are thinking practically then it's a point to bear in mind, and perhaps at the forefront of your mind. Are you really going to study contemporary theory in the Anti-Moscow Gambit when the only people who play it are people who you meet maybe once every two seasons and who are graded wildly higher than you anyway? Or might you be better off thinking about the Colle System that you come up against several times a season - and never really know what you should do against? It was a great tournament but in truth it came a week too soon for me. Following directly on from the British Championship, what with chess, academic work and blogging, I just got a bit overloaded. I wonder if it's a feeling shared by some of the players. Of the five guys who came to Simpson's-in-the-Strand via Torquay only David Howell clocked up a performance result that exceeded his current rating. True Gawain Jones was only a couple of points below his 2554 (a great comeback for The Corporal who started the tournament with +0 =1 -4 after finishing the British with +0 =2 -2) but Williams and Wells underperformed to the tune of 70-odd points each and Trent had a real 'mare losing five games all told, including one against tournament sponsor Terrence Chapman, and winning none. Trent and Wells kicked off the festivities with an eleven move draw. The former was spotted asleep in the bar a few minutes before the round started so the speedy conclusion to the game was not entirely unexpected. As things turned out, it was not to be either player's shortest game of the event. Wells went on to draw in 18 moves against IM Hendriks in round 3, 16 against Jan Timman in round 6 and 10 against Chernaiev in round 8. Not a stellar performance from the GM who finished on -1 and whose only victory, other than against Chapman, came when Nigel Davies left a piece en prise. Twenty chess games in twenty-two days is a pretty tough schedule though. It's perhaps not surprising that it led to this last round epic between Trent and our blog stalkee. "... it would appear that the English have never in fact learned to arrange draws beforehand. In a way that you can't find fault, because it's done so well. As a textbook example for the English and for others who are equally uneducated in this respect, I will give without commentary one partly forgotten game." Ironically, now the tournament's over I have the time for as much chess as anybody wants to throw at me. My free time has come too late to pay any more visits to The Strand but over the next week or two I'll at least try to catch up and write about my memories of the 7th Staunton Memorial. It was, after all, a great tournament. It's an announcement day here on the S&BC Blog. I will be in London from Saturday 22/8 until Monday 24/8. I actually get in late on Friday. I was looking at the various club links on your blog, and it seems most of the clubs meet on Mondays which doesn't help me since I'm heading to the Netherlands that afternoon. I was wondering if there is a group of players that meet in a pub or cafe on Saturday nights. I would love to have the opportunity to meet and play some players during my short stopover in London. I will probably make a stop at the London Chess Centre, but I know they just sell books and equipment. I've afraid I'm clueless. Can anybody help Polly out? Please leave a message in our comments box if you can. Second up, an announcement from Quality Chess. Since (a) their books - judging by the two that I've bought - live up to the company name and (b) co-owner Jacob Aagaard is a (very) occasional visitor to these parts, this tournament's worth supporting. I always wanted to go Edinburgh, perhaps this would make a good opportunity. Quality Chess is sponsoring an international all-play-all tournament in which IM norms will be possible. The event will be hosted by Edinburgh Chess Club. Edinburgh Chess Club is one of the oldest chess clubs in the world, and has been visited by many chess greats, including Capablanca, Alekhine and Karpov. Time control: 40 moves in 2 hours, then one hour to finish. I have not included FIDE ratings, as I believe FIDE will release another list on September 1. Thus, the exact norm requirements are not yet known. Pairings will be done nearer the start date. The field includes four former Scottish Champions (McNab, Thomson, Grant and Tate). Right, that's your lot for today. Tomorrow we're back for another look at the Staunton Memorial. If you were in the tournament hall of the 7th Staunton Memorial at around 3:45pm yesterday you would have seen Nigel Short striding from the room punching the air as he went - and why not since he'd just ended the tournament with a rather perky looking +6 =4 -0 and a 2862 rating performance to go with the 2900+ one he notched up a couple of months ago in Malmo. Marvelous stuff from Nosher who, as my friend and fellow blogger EJH recently pointed out over on the EC Forum, is proving to be a real inspiration for we chess players who would like to believe it is possible to significantly improve our results in our forties. In other circumstances such a sharp rise in fortunes for a man of Short's relatively advanced years might have raised a few eyebrows. A few days ago, though, I happened to be in the gents when Nigel came in and I can exclusively reveal to readers of the S&BC blog that he did nothing more suspicious than take a wizz. No electronic lavatorial assisance for The Nosh. ... which I leave as a puzzle for the reader to solve. 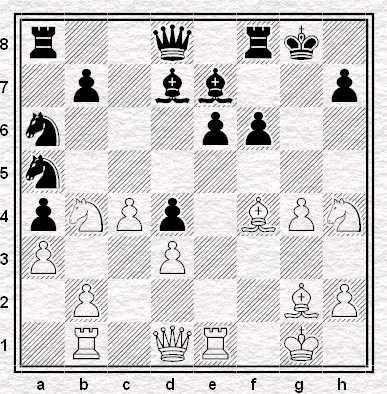 ... the position already looked good for Black to me. There's a lot of space for Nigel's pieces over on the kingside and my first glance assessment was that a direct attack against Werle's rather lonely looking monarch might be in order. And that's pretty much now it turned out. So well done Nigel, well done the English team for winning the match 26.5 - 23 and well done Jan Timman for winning the all-play-all. Well done old Victor Korchnoi for a fantastic tournament (+5 =2 =2) and well done the Staunton folk for getting him there in the first place. Andrew Stone informs me that S&BCC London League top board Venkat scored an IM norm at the recent Uxbridge International tournament. A quick trip to the tourney website tells me he managed to secure this result with a round to spare! Well done him. It's been seven months to the day since the last TIFE. Sorry it's been so long but I've been a bit short of material of late. Last season not a single person played The Exchange against me. Not one! It's enough to make a man give up playing the French so it is. White had punted 8. Qb3 0-0-0, 9. 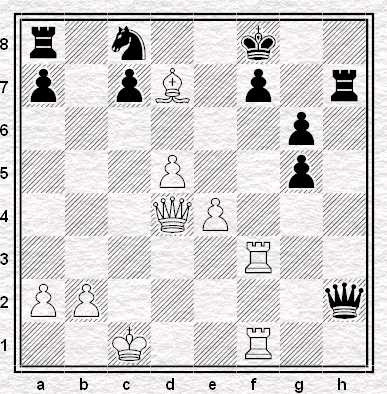 Qxd5 Nf6 instead of the more careful 8. Qc2. "A correct offer of a pawn ... Black [has] an overwhelming advantage in development." I think this line is probably better for Black than the Cherniaev - Williams game but still, I can see why the Psycho-Cowboy chose to ride that particular horse. Chucking in another exchange on the thirteenth move though? That I'm less clear about. Not a lucky game for Williams that one, but do I detect the influence of The Corporal in the timing of the resignation? Ah well. Hopefully he'll make up for it by playing the Classical Dutch against Korchnoi this afternoon. Fingers crossed. I know a lot of the games in TIFEs I to IX don't play properly. As soon as the Staunton and academic stuff is over I'll get them fixed. Wouldn't want to lose them would we? The Orient! King of Games, Game of Kings! Renaissance! Entertainment! Eroticism! The Abyss! Mate! 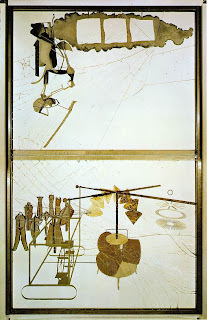 The Moment of Duchamp! Geometries! Art is the Game! 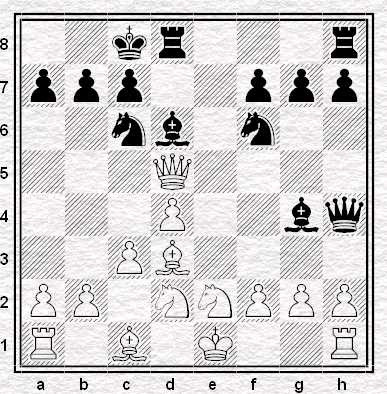 These are the evocative chapter headings of Yves Marek's book "Art, échecs et mat" (note 1) and they add up to proof that as a genre, art based on chess, with its subject's chequered history, chameleon social role, and resonant gaminess, has a richness that knocks most others into a cocked hat. 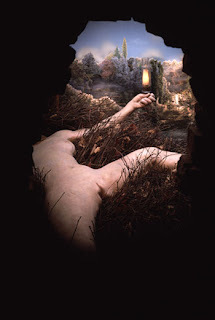 Take the "Abyss" sub-genre, and explore a small niche therein: the one-up Abyss picture. It has a simple visual formula: board (or part thereof) + pieces (a decent selection) + one player (top whack). The theme, the text, the message in these vignettes is that the implacable opponent of the lone player is the monstrous infinity of chess itself. You can't beat it! Baba's player is of humble peasant stock (look at those hands) and at rest from the daily grind he phlegmatically applies himself to his toil at the board. He sits like a Buddha in a ten-foot cell (note 2). A Cezanne influence is clear; the figure has the structure and substance that he wrought in his ground-breaking portraits, still lives and landscapes. Like Mont Sainte-Victoire, Cezanne's favourite picnic spot, the solitary presence dominates the image. With no human opponent on show what can the poor wretch do but gaze, transfixed, at the board, and peer beyond its brittle surface into the bottomless pit of possibilities. His head spins as vertigo's grip tightens and he mouths a silent scream into the maw of the unknowable gaping before him: the inaudible in pursuit of the ineffable. He stares into the Abyss. It doesn't help to be a retired bank manager (note3) for the Abyss pays scant regard to social rank or distinction. The artist has captured the passage of time, infused with melancholic nostalgia, in this atmospheric study of ageing. Engrossed in his move for so long he hasn't noticed the years slip by. He is drained of colour and life by the ebbing light and, as they did on Miss Havisham, the cobwebs will settle as his time runs out. He is lost, there is no way back, and in the Abyss no one can hear you think. Effecting a casual nonchalance won't work either, nicely caught in this next quirky, droll, almost caricature piece, with the player's ungainly angular limbs set off against the unperspectived board. Archness expressed by a raised eyebrow may intimidate a human opponent, but when it is one-on-one-who-isn't-there, and you confront the Abyss alone, trying to pass as Jean-Paul Belmondo will likely result in an anxiety attack and shortness of breath, which those French ciggies will just make worse. To be fair not all player+board+pieces pictures are doom-laden as those above, especially if youth or femininity is involved. This Young Pioneer is a picture of innocence. 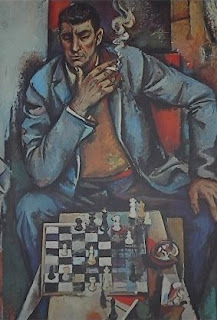 He can just reach the pieces, his sense of wonder burns brightly, and he faces the future with confidence, as Socialist Realism has taught him, together with an unshakeable conviction in the ultimate triumph of the Soviet School of Chess. But time is on his side, he may not fall into the Abyss; he may end up doing judo like Mr. Putin. Women seem also to float above the Abysmal gothic horror. Mrs M. hasn't the faintest idea what to do with the pieces (she would regard this as a compliment) except to get the maid to tidy them away after the sitting. 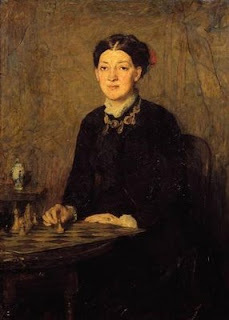 In this gracious study of a Victorian lady with chess set, tea and cucumber sandwiches would do just as well. Abyss won't immediately be on her mind, but should it occur, she may have to do battle with that ghastly new-fangled water-closet. For contrast, here is a woman in full dragon-slaying mode. Alexandra is no sheep in she-wolf's clothing, but is hard to the core. She looks with steely determination; there is no softening of the features, such as the mouth, even though, in this image, there is no chance of encountering the crack of doom. Perhaps a bottomless chasm might provoke some kind of reaction, and then Abyss would be good as a smile. Formally speaking, the portrait relies heavily on a photograph (that's how they do it these days) the colour is not naturalistic (thank the Fauves for that) and the background is rather busy (a kind of aura, or force-field). In its way it is all very effective, and the gaze stops you, standing in for her opponent, dead in your tracks. If looks could kill then Alexandra is guilty of first degree murder, so maybe she has a better home in the "Mate" chapter in Marek's book which analyses Death! Regicide! Faust! Perhaps we might tip-toe through that theme another time. 1. Yves Marek, Art, Echécs et Mat. (Imprimerie nationale, Paris, 2008.) 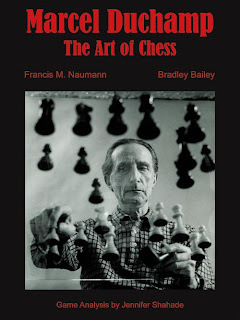 New French book exploring various aspects of chess in art. The exclamation marks are not his, and he bears no responsibility for what follows. 2. While Rubin sits like Buddha in a ten-foot cell/ An innocent man in a living hell. / That's the story of the Hurricane... Bob Dylan and Jacques Levy (1975). 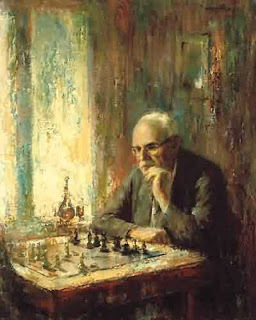 The Baba discovery comes from Art Inconnu: Chess. Thanks to the James Bros for providing the lead to it. 3. Especially one with an uncanny resemblance, I fear, to my doppelganger 15 years hence. Though I have never been a bank manager.